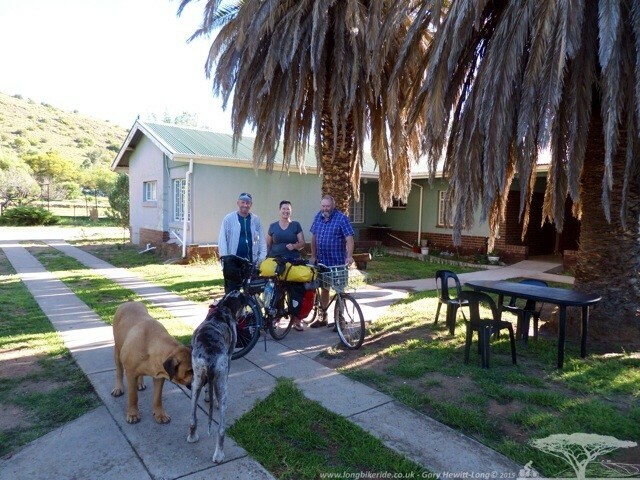 Cycling to Bloemfontein was relatively easy and straight forward, rolling along the N5 from Bethlehem to Paul Roux, through Senekal, Winburg where I stayed at Danke Schn, onto the N1 and Bloemfontein. The main road although not the best place to cycle nor the most scenic was trouble free and quick with a tailwind. There were a few showers on the way which I managed to avoid and could see breaking around me. 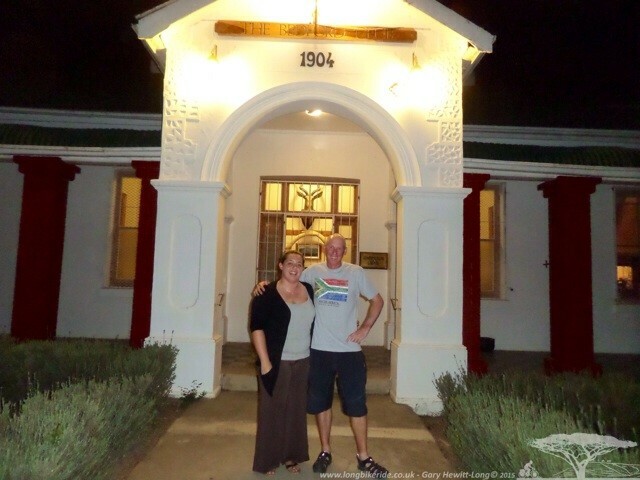 Whilst in Bloemfontein I stayed with Helen and her partner Andy who are both originally from the UK. Helen I had met while staying at Jollyboy backpackers in Livingstone, Zambia and had invited to stay if I came that way. With the hilliest routes ruled out because of the pain in my knees I took her up on her kind offer. 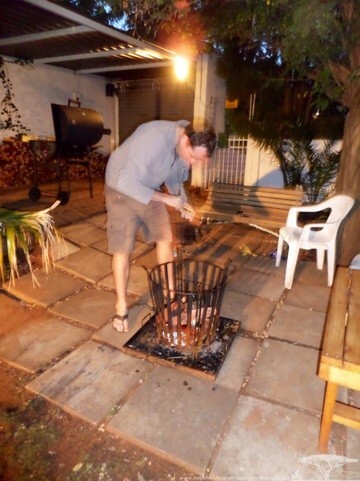 After arriving and freshening up Andy arrived home and set about firing up the braai for supper. Their friend Daniel also English joined us and after we headed to an Irish bar The Brazen Head for a night cap. The following day Helen had to sort out some immigration paperwork to be able to stay and study in the country. The list of documents she needed and expense seemed ludicrous, statements from the police in the UK to prove she’s not a mass murderer etc and the like. A stressful task. Beforehand Helen drove me up to Naval Hill, oddly named you’d think as the sea is miles away. 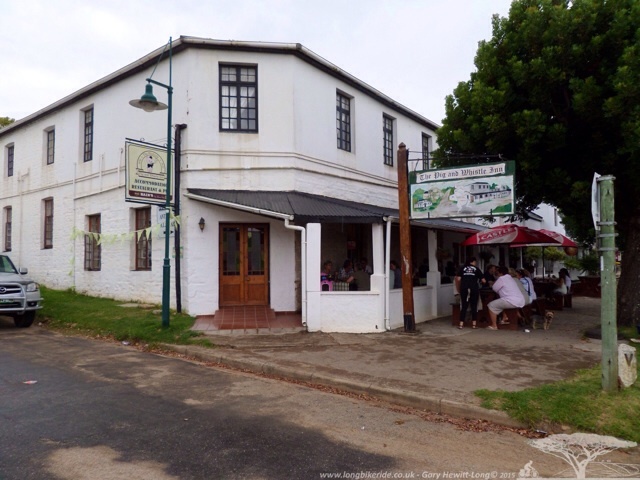 Named after the Naval Gun Emplacements on the hill during the Anglo-Boer War. 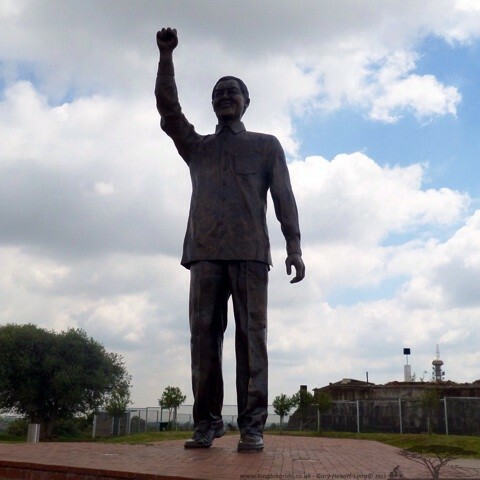 There is also another statue of Nelson Mandela on the top of the hill, for some reason they really liked this guy here! 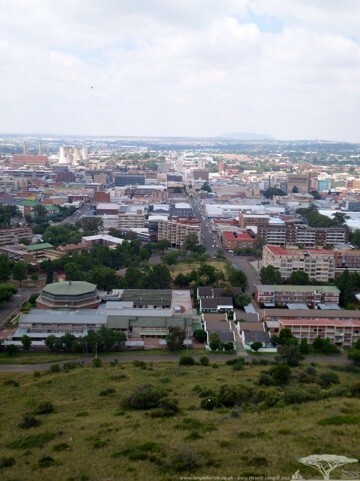 From Naval Hill, you can see Bloemfontein very well. Helen pointed out the layout of the town, it was set up with Apartheid in mind. 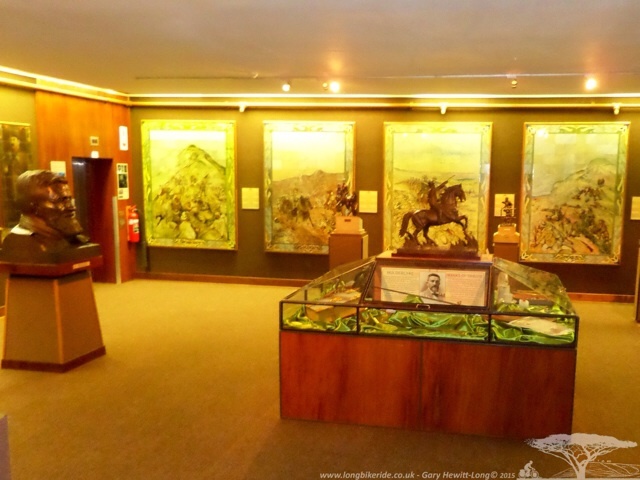 Also in Bloemfontein is the Anglo Boer War museum which has a section on the concentration camps. The British forces in reaction to the guerilla warfare tactics of the Boers put women and children in concentration camps. Many did not survive and rations for those whose family fought against the British were much reduced resulting in malnutrition and being more susceptible diseases that were prevalent in the camps dues to poor hygiene. 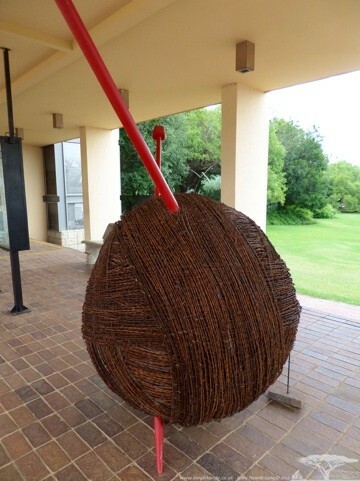 Outside of the museum there was a sculpture of a ball of wool and knitting needles, the wool made from barbed wire. Inside the museum photography was not allowed, somehow my shutter finger slipped..
Travelling along the roads I came across a lot more wildlife, still more tortoise suicidally crossing the roads. 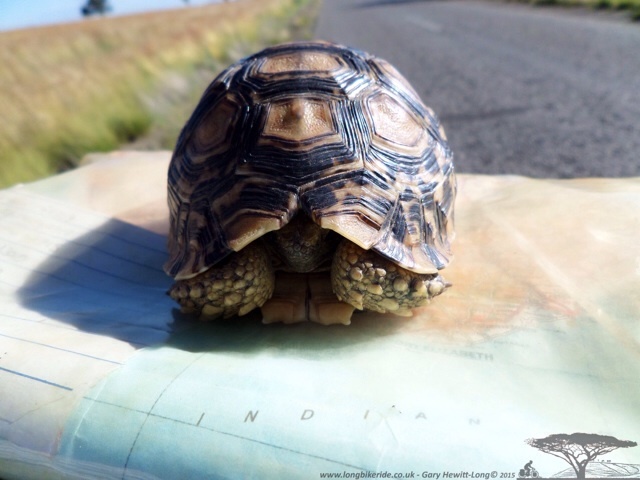 Where I found them still alive, picking them up and moving them into the vegetation on the sides of the road where they are were more likely to be safe. Places to wild camp are still possible to find. 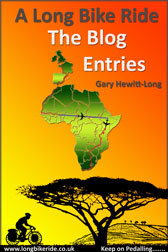 I had heard that it would be much more difficult after entering South Africa. Most of the farm land is fenced off and because of the weather conditions here, fences tend to corrode less and are in very good condition despite being very old. 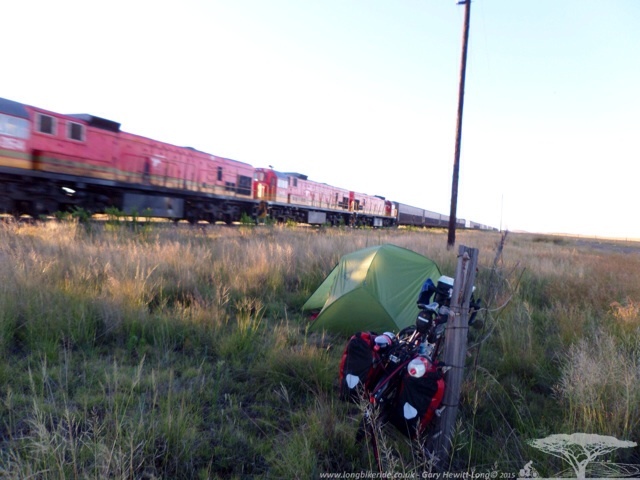 After riding through Trompsburg on the way to Springfontein I turned onto a dirt road which followed a train track. By the side of the track the fence for a change was in a poor state of repair. The road barely used with vehicles preferring to use the tarred road which took you several miles further I was able to camp by the side of the train track where the fence was broken. Luckily the trains only went through a few times in the night, waking me but I soon dropped off again. The line a single track carrying both freight and passengers both ways. My target for the next day was Bethulie, a larger town on the route I was taking. Heading into the town there were signs for many establishments to stay n, bed and breakfasts, hotels, guest houses and a new sign for a back packers. The sign had the GPS coordinates which I put into the phone and cycled on. 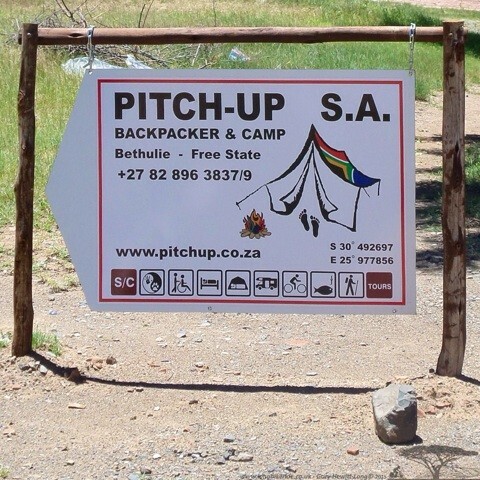 Pitch Up the backpackers was not fully open but I was warmly greeted by Huntley the owner who then showed me to a room as the campsite was not ready yet. After dropping off the bike Huntley offered to take me on a small tour of Bethulie in his Land Rover. We drove off to see the bridge over the River Oranje, aptly named with it’s muddy colour making it appear very orange. Amazing to think fish live in the river as it was so thick with mud, one would think nothing would live in it. Bethulie is on the edge of the river which has been dammed to create the Gariep Dam back in the 1960’s. This raised the water level which at the time the authorities were not sure to which level it would raise to. 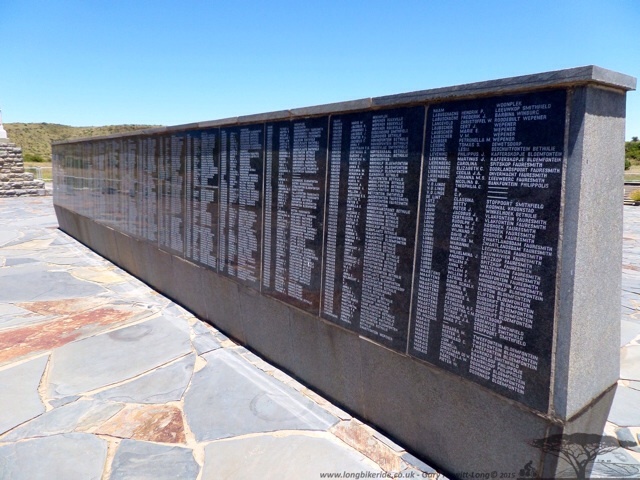 A memorial and the grave site of those that died in the concentration camps and in the Anglo Boer War were moved to higher ground. In the new location they have put a new memorial wall listing the name of those who died. 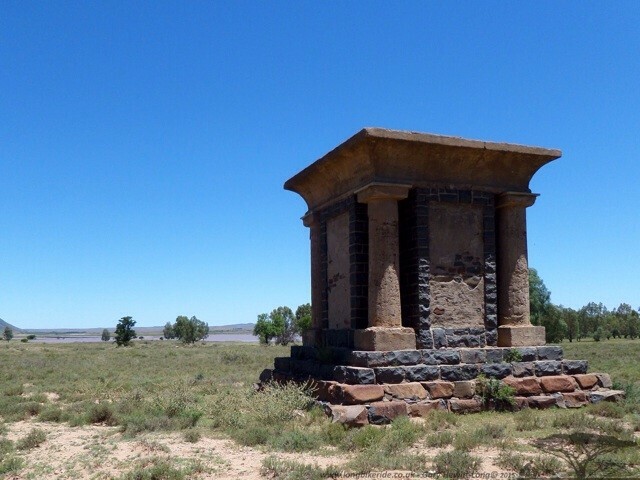 Down at the original location which it turned out did not flood is another memorial which was never completed from the British Women to the Boer Women. Funds ran out before the memorial was completed, a real shame. After my tour of Bethulie, Huntley took me back in town for lunch and then invited me to play Lawn Bowls later in the afternoon. 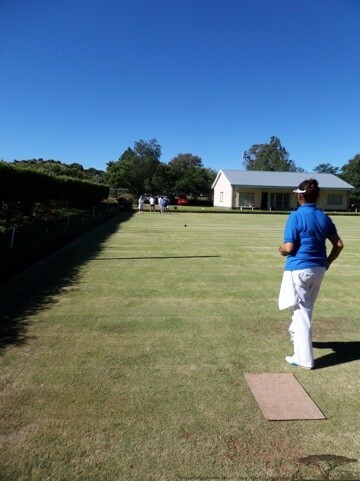 Lawn Bowls I have never played before so took up the offer. 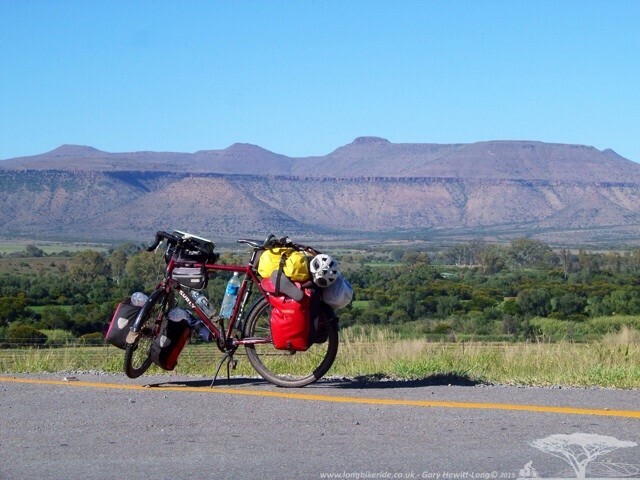 The weather in South Africa is ideal for this sport, they have sun all year round, even during rainy season the rain does not last long. On arrival at the club I was introduced to several of the other members one of which was a lady by the name of Romey who asked me where in the UK I was from. I explained as I normally do, near Stonehenge as most people have heard of this, most have not heard of Devizes. Romey asked me the name of the town and stepped back in surprise. Romey had lived in Marlborough for a long period of time and her mother lived in Devizes! 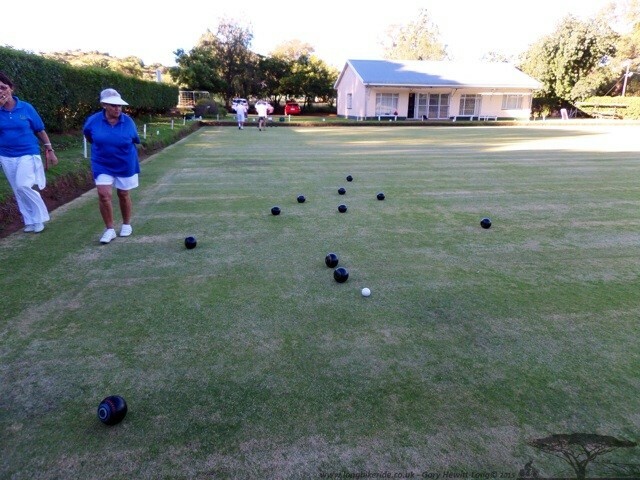 Bowls was fun, having never played before I got the hang of quite quickly but to begin with had to keep asking which way round I had to hold the bowl to ensure it didn’t curve off in the wrong direction. My stay at Pitch up was longer than I expected, waking up the day after not feeling particularly great, I decided to take a day off. The rooms were very comfortable and Huntley and his wife were very welcoming. The following day I left to continue my journey but not until I had taken breakfast with Huntley and Anne. Coming out of Bethulie I soon turned against the wind and had a lovely ride toward the town of Cradock before heading on to Bedford. 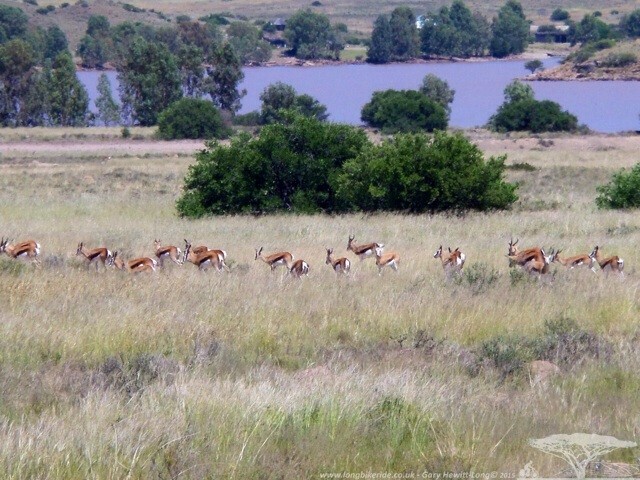 The route was full of wildlife, ostrich, springbok and lots of troops of baboons and the like. The hills started to come into view and the scenery changed, lovely mountain back drops but still only a few hills to actually ride over, the roads mainly avoiding the hilly areas. Some hills and mountains had wonderful layers in them. Beautiful country to ride through, I stopped regularly to take photographs. Stopping places need to be careful, not only to ensure I was away from traffic but also the ants, some of which swarmed towards you when you stop and trying to bite you all over. Along the roads there are signs of how harsh life can be here in the bush. Skeletons and road kill along the way. 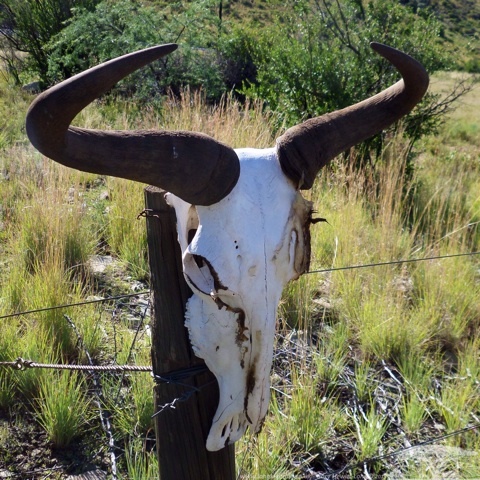 Someone putting up a Wildebeest skull on a post. As I turned left toward Bedford after descending from Cradock the wind started. A horrible headwind and then to make it more challenging the hills started and temperature rose. Stopping by the road I filled up my water bottles and a truck stopped by me to ask if all was OK. The driver Thys Van Tonder directed me to a customer of his, a vetinary supplies place in Bedford. I arrived there later than I hoped to as the weather got hotter I sought shelter under a tree and with the umbrella I carry covering my head from the sun took a nap for an hour. On arrival I met Shirley who welcomed me to Bedford. She’d been on the phone after receiving a call from Thys and had arranged somewhere for me to stay with a Lana in the village who had some property to let out to guests. I was fortunate in that she offered me a place to stay completely free of charge. Again the South African Hospitality is wonderful. Shirley invited me to the Bedford club for an evening meal and meet the other members. 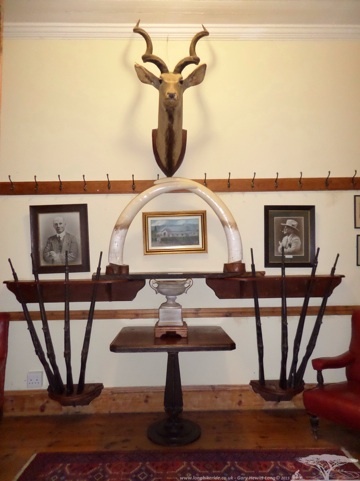 On arrival the club is an impressive building, built in 1904, decorated with game and elephant tusks and surrounded by wood panelling. The club was originally a gentlemen’s club which undertook some reform allowing women members several years ago. Since Women have become members the club has continued to grow, building on an extension. The building and surroundings very plush as you would expect and the company entertaining and interested in my journey. The snooker table in the club looked older than the one we have in the Devizes and District Club. Pockets also looked slightly larger, easier to play on..
Before I left Veronica and her mother Corrie asked me about my journey and took photos for the local town paper. 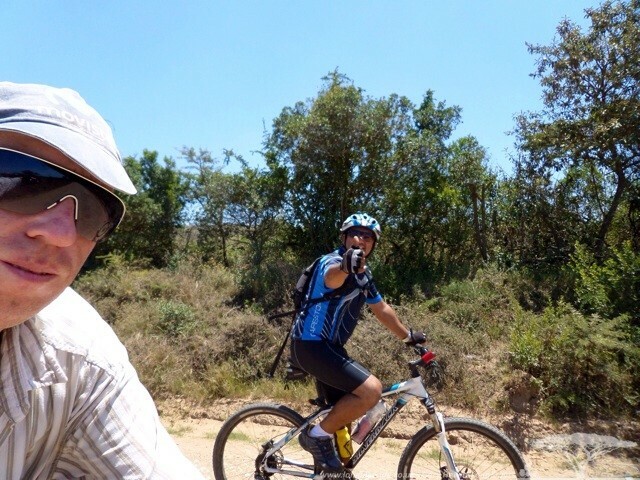 My target the next day was to ride to Grahamstown a stone’s throw from Port Alfred. I had accommodation prearranged in Grahamstown, where I was due to stay with Maggy Clarke, the mother of a couple who I had met in Malawi. Helen, Dominicue and their children Laura and Jack I had originally met in Malawi at Mayoka Village on the shore of Lake Malawi a few months before. 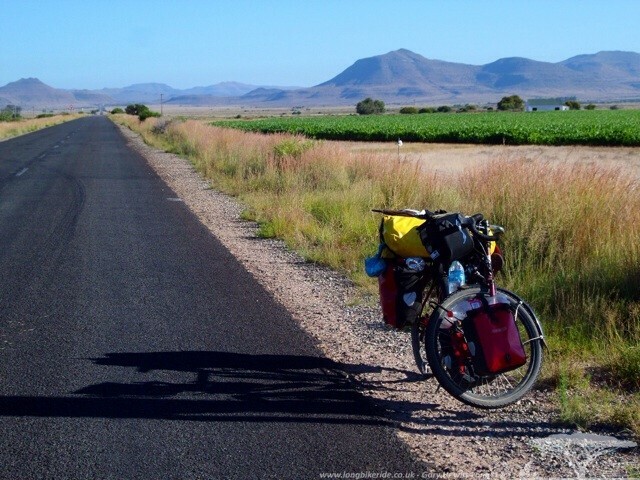 Originally I had intended to ride to Port Elizabeth to then continue along the Garden Route toward Cape Town. 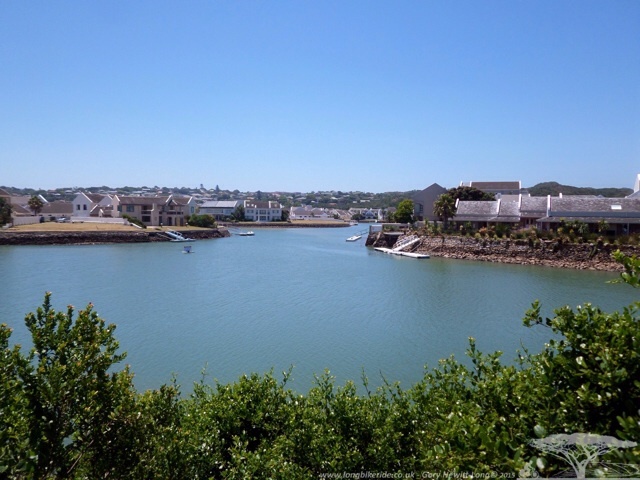 Port Alfred being only a short distance away and the opportunity to meet up with Dom, Helen and family again my route was changed. Helen and Dom put me in touch with Helen’s mum for me to stay the night with the plan of Dominicue riding with me the next day to their home. Maggy originally from the UK made me feel very welcome, an interesting lady who had originally travelled overland in Africa in the early 1970’s in a land rover with her husband. Reading through her book of their trip was fascinating, being a different time with different problems in Africa, Maggy and her husband had travelled through several countries that nowadays are difficult to travel through, Algeria, Niger and the like. The following day a reporter for the local paper arrived at the house and I was interviewed about my trip. The reporter a cyclist herself was very interested in the more technical side of things, how I had built bike up, what components were used and details like the weight of my luggage, how many bags I had etc. Setting out from Grahamstown and after filling our water bottles from a natural spring in the town, Dominicue took me a route I would not have taken without the local knowledge he has. 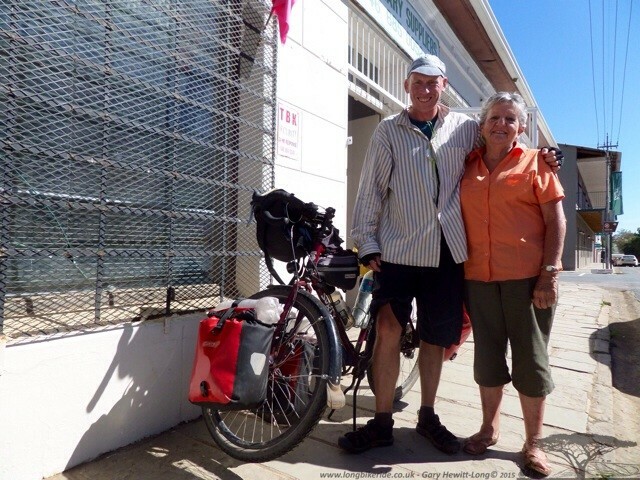 We followed the Southwell road to Port Alfred rather than riding along the normal N2 route. The trail mainly gravel track and with very little traffic was a little rough especially with my bike as it was now unloaded, Helen kindly taking my luggage and panniers in the car back to port Alfred. As we came into Port Alfred Dom took me along the river to the sea. I had been quite excited about seeing the sea again. 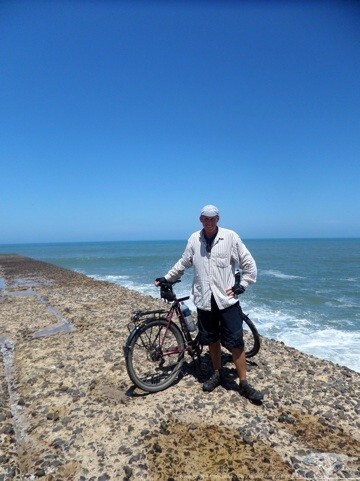 The last place being the Atlantic ocean in The Gambia almost 6,000 miles of pedalling since then. This time the Indian Ocean in Port Alfred, South Africa. 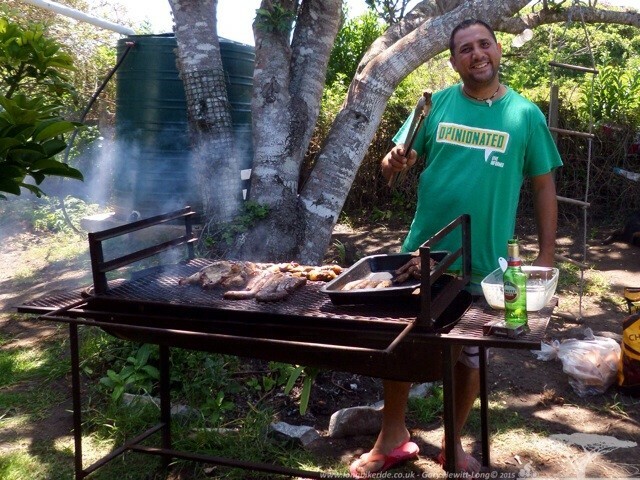 With a few days to rest with Dom, Helen and family, Dom and Helen did what South Africans do well, organised a braai, invited around a couple of friends and cracked open some beers! 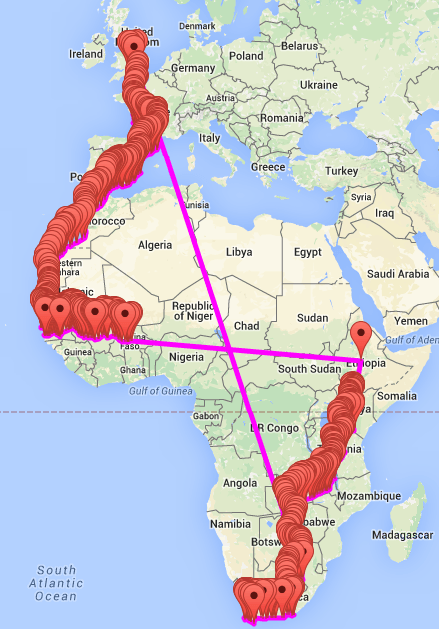 I met Leoni and her husband, Leoni herself a tourer who has toured several times in Africa. Lots more talk on bike tech and touring. Port Alfred has from what I have seen a very relaxed atmosphere. Right next to the sea it is cooler and the weather very nice. Walking to the beach and simply sitting there watching the children play and Helen surfing while I chat with Dominicue is very relaxing. Earlier in my trip I had been told I must go to Bathurst, only a few kilometres from Port Alfred. 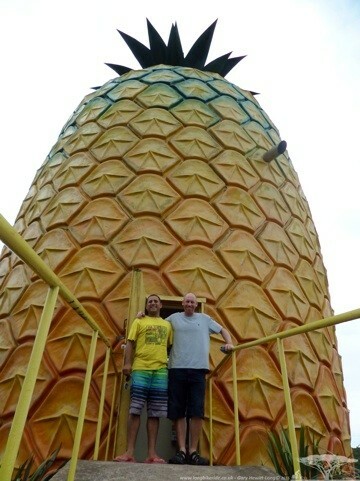 After a morning at the beach we all hopped into the bakkie and drove to Bathurst stopping at the Big Pineapple on the way. The big pineapple being local tourist attraction and giving the history of growing pineapples especially in South Africa. Reading and seeing pineapples being grown shattered my illusion that pineapples grew in trees. Spongebob lied as well, they aren’t under the sea. Pineapples grow on the ground. 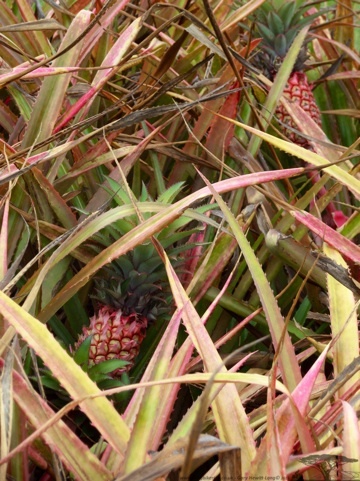 Pineapples, neither under the sea or in a tree, grown on the Ground!! Arriving in Bathurst the Pig and Whistle does indeed look like an old English pub inside and out. Unfortunately though there was no real ale! The whole village of Bathurst is a little like an old English village, the farmers market was full of local produce and mostly reasonable priced. 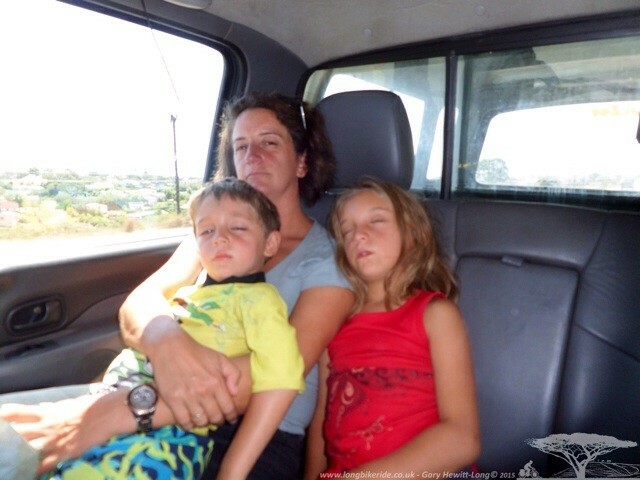 The day out was tiring and Laura and Jack slept on the way back to the house. One evening during conservation I mentioned that I hadn’t had flapjack since just after leaving England. 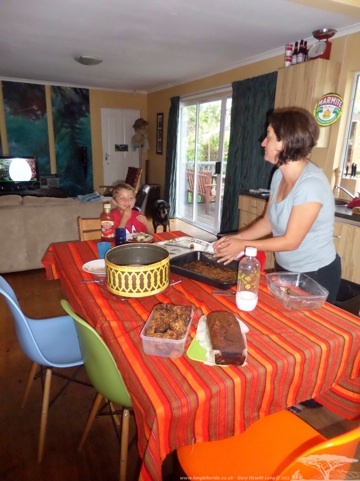 Helen explained that it was available in South Africa but was called Crunchie and she made them regularly. A big batch was made up with lots of syrup and butter, wonderfully delicious and super cycling food! Power to Cape Town and Beyond!